Composite Raised Garden Bed Kit. Eco-friendly timbers are made from recycled plastic and natural fibers. No toxic chemicals.. Frame It All's modular system allows endless design options. You can add on or reconfigure your raised garden bed at any time using existing or additional Two Inch Series Frame It All components and accessories.. Low maintenance - timbers will not rot, warp, splinter or fade.. Composite boards are made from 38% post-consumer recycled plastic and 62% sustainable hardwood fibers.. Two Inch Series composite kits are made from 2in. thick, flat profile boards.. 5 Year Warranty. 4 ft. L x 16 ft. W x 11 in. H. Frame It All - Simple Modular Gardens. The gardens that grow with you. 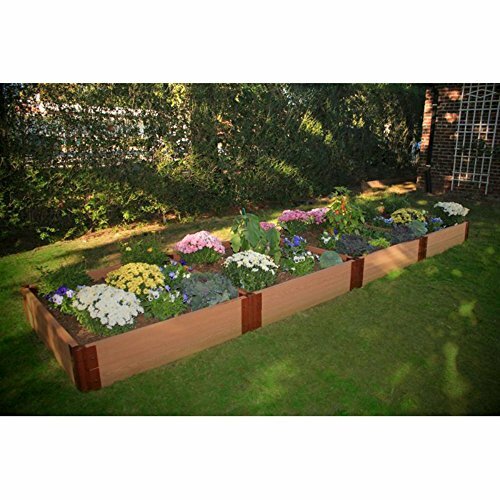 The Composite Raised Garden Bed Kit provides ample square footage for the serious gardener. If your love of gardening runs deep, you'll appreciate the extra soil depth the kit provides. Almost any type of crop will do well in an 11in. bed - even root vegetables. Bold 2in. profile timbers create more perceived value for your landscaping investment. With 64 square feet of available planting area you'll find many uses for this versatile kit. Frame It All's modular system allows endless design options. You can add on or reconfigure your raised garden bed at any time using existing or additional Two Inch Series Frame It All components and accessories.